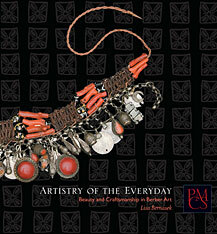 Artistry of the Everyday presents the Peabody Museum’s collection of arts from the Berber-speaking regions of North Africa. The book gives an overview of Berber history and culture, focusing on the rich aesthetic traditions of Amazigh (Berber) craftsmen and women. From ancient times to the present day, working with limited materials but an extensive vocabulary of symbols and motifs, Imazighen (Berbers) across North Africa have created objects that are both beautiful and practical. Intricately woven textiles, incised metal locks and keys, painted pottery and richly embroidered leather bags are just a few examples of objects from the Peabody Museum’s collections that are highlighted in the color plates. The book also tells the stories of the collectors—both world-traveling Bostonians and Harvard-trained anthropologists—who brought these objects from Morocco or Algeria to their present home in Cambridge in the early twentieth century. The generosity of these donors has resulted in a collection of Berber arts, especially from the Tuareg regions of southern Algeria, that rivals that of major European and North African museums.